Your guide on this special tour is Alfonso Cleveland Morales. Alfonso is the Director of the Proyecto Grupo de las Cruces, an archaeological project excavating in the Cross Group of Palenque since 1997. He has a Master's degree from the Institute of Latin American Studies at the University of Texas at Austin and is currently a Ph.D. candidate in the same program. He has 35 years of experience guiding at the ruins of Palenque and elsewhere in the Maya World including Tikal and Copan. He was recently featured in two History Channel programs about Palenque -- the "Lost World" series. February 19: The nearest international airport to Palenque is in Villahermosa, which is 2 hours away. As most flights arrive too late in the day to go directly to Palenque you will spend your first night in Villahermosa. A driver will be waiting when you arrive to take you to your hotel. Take time to unwind, enjoy the lovely swimming pool and relax after a day of travel. Overnight Hyatt Regency Hotel Villahermosa. 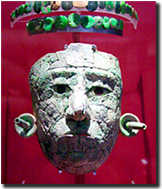 February 20: The day begins with a visit of La Venta Olmec Museum in Villahermosa. 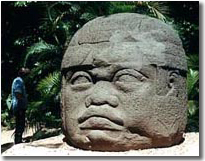 There are 28 Olmec carvings at this beautiful outdoor museum with interesting zoo and lake. Each piece was set carefully for optimum viewing with benches placed for those wishing to meditate or ponder. The huge and amazingly well crafted Olmec heads, intricate altars, and intriguing stele and statues makes one pause to reflect on the mystery of who these pre-cursors of the Maya people were. We’ll also visit the newly remodeled Carlos Pellicer Museum of Anthropology. On display is the controversial Tortuguero Stela 6 which has rare inscriptions referring to the end of the 13th baktún, which corresponds to December 21st, 2012. Then we'll go to Palenque. You'll have time in the evening to explore this interesting modern Maya city. Your hotel is nestled in the forested "La Canada" area of Palenque. Enjoy a refreshment by the pool and get to know your fellow travelers. Catch up with others and upload your pictures to friends with the hotel's surprising fast wireless internet connection. There is a very good restaurant just a block from the hotel -- the Maya Canada. Through the years our clients have enjoyed its wide array of incredible Maya cuisine as well as its wonderful veranda in the trees. Overnight Hotel Maya Tulipanes in Palenque. February 21: Today we have a full day to visit one of the most spectacular of Mayan archaeological sites, Palenque. 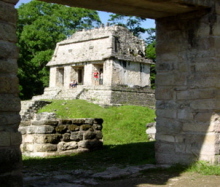 A UNESCO historical monument, Palenque is considered a world treasure. 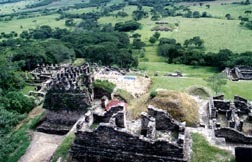 Ancient structures rise out of the lush rainforest on multiple terraces set against the mountains. The lush rainforest with its oversized flora and fauna has a scent and feel unique to any place on earth. At any given moment you can hear the roar of the howler monkeys that call the park home, or the parrots and toucans who always seem to have something to say. Many wonderful examples of Maya art and history are carved into the buildings' facades, some of them the most famous depictions from the ancient Maya world. Here you will find the unique building styles that caused early explorers to think that the builders of Palenque were influenced by Eastern or Asian architectural concepts. Palenque is exciting because of the vast amounts of information that has been painstakingly brought to light by archaeologists over the years. Currently, a group of archaeologists are conducting archaeo-astronomy research at the site and are discovering many hidden clues that connect ancient Maya astronomy to the architecture of the site. We'll also visit the Palenque archeological museum. This impressive collection of sculptured art, busts, jade jewelry, and other artifacts of the Maya give us a look into their ancient world. The amazingly well-preserved and intricately decorated clay incense burners alone are well worth the visit. Overnight Hotel Maya Tulipanes. February 22: Today we journey to Yaxchilan and Bonampak. First we visit Bonampak, home of famous Mayan murals. 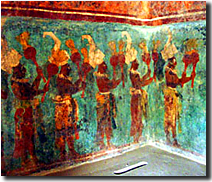 Their ancient colors remain clear and vital, making them an excellent representation of Mayan art. 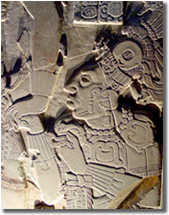 Bonampak also has some very well preserved stele that detail important historical moments. The Lacandon Maya are the caretakers of this site. The Lacandon were never Christianized by the Spanish. They were to hard to find as they could disappear into the mist of the forest in the blink of an eye. To this day they still practice their spiritual traditions at 3 of the sites you will be visiting while on this tour. There are only around 450 Lacandon Maya left today -- the smallest of all the different Maya sub groups. Pressure from the outside world and deforestation are major challenges for the Lacandon today. 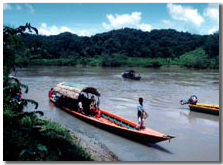 Then we travel down the Usamucinta River to the mysterious ancient site of Yaxchilan. This incredible boat ride through the rainforest with its huge trees and abundant wildlife makes you feel like you are in an Indiana Jones movie! Keep an eye open for lumbering crocodiles basking in the sun or the quite animated and ever "yacking" spider monkeys swinging through the trees. The tremendous archeological site of Yaxchilan, situated on the riverbanks, rises in levels to temples with breathtaking views of the rainforest stretching far into Guatemala. 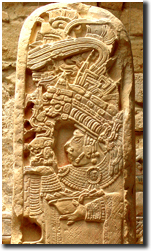 You'll see very rare depictions of ancient Mayan Queens who exerted great power engaged in ritual ceremony. Hear the rainforest resound with the howls of howler monkeys and exotic birds as you roam this well organized ancient Maya city. Overnight Hotel Maya Tulipanes. 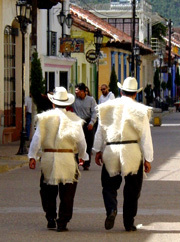 February 23: Today we go to nearby Tenosique to observe the "Pocho" dances. Each year, beginning the last Sunday of January through the Sunday before Lent, a group of Maya congregate in a small village near Palenque to hold their "Pochó" dances. The Pochó is considered to be a god that embodies evil. 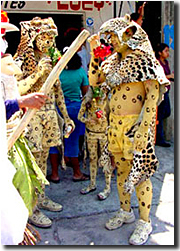 Three types of beings enact this dance: the "lame" or men, the "tigres" or jaguars, and the "pochoveras" or women. The lame are upper creatures of nature, in who the gods have placed negative and positive characteristics. The harmful god Pochó desires the destruction of the men and sends the tigres to eliminate them. The group of pochoveras acts as a link among the Pochó and the terrestrial beings, and later as mediator between lame and tigres. Over the years our clients have had wonderful interactions with the dancers and the local people that are there to celebrate the dancers and the story they reenact. Later in the afternoon you'll have some free time to explore Palenque on your own. A short walk up main street to the main square brings you to artisans with carvings of limestone, jade and obsidian as well as beautiful textiles hand woven by the Highland Maya. Overnight Hotel Maya Tulipanes. February 24: Today we travel to San Cristobal de las Casas, journeying through small villages of Maya communities and through several diverse and distinct eco-systems. 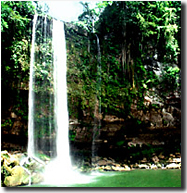 Along the way we'll make a stop at the beautiful Misol Ha waterfalls and also visit the Mayan ruins Tonina. Toniná may have been built as early as 350 A.D. but one of its distinctions is having the last recorded date of the Maya long count. One of the features at the ruins at Toniná is its maze-like building of rooms. The number of rooms and the building's position with the night heavens suggest it had an astronomical function. It also has a very well, preserved somewhat macabre fresco. 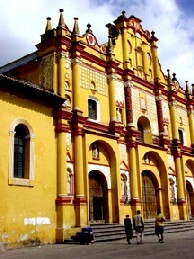 Your hotel in San Cristobal de las Casas is close to the main square and the markets. Overnight Plaza Gallery Boutique Hotel in San Cristobal de la Casas. February 25: "Fat Tuesday": This morning we visit the indoor/outdoor community market in San Cristobal de las Casas for a unique taste of modern Mayan culture. 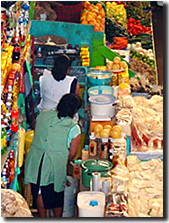 Not a market slanted toward tourism, this market is the heartbeat and hub for the entire Mayan economy of the highlands. The wide variety of locally grown produce is both colorful and fascinating. In addition, many Mayan groups are represented with a full array of traditional goods that each group specializes in -- textiles, amber, carvings, incenses, candles, healing herbs and more. Mid-day we visit the pre-Lent festival and jaguar dances in the neighboring village of San Juan Chamula, with its famous Mayan church where one can observe the modern spiritual practices of the Maya. This annual celebration is one of the most important rituals celebrated in the Maya world, one that takes an entire year to prepare for. Hundreds of people reenact the story of their history -- starting with Creation and moving through time to the Spanish Conquest and the rebellions that ripped off the yoke of Spanish rule. Your guide will explain the roles of each of the different costumed peoples, the meanings of the banners they bear and their place in the ongoing story of the Maya. You'll see the "monkey men" clowns poke fun at onlookers (all in good jest). With the multitude of different multi-colored banners and costumes it is like looking at the making of those old epic movies with casts of thousands. Then we'll visit the Tzotzil village of Zinacantán with its renowned embroidered textiles, where they also hold a very colorful "Carnival" festival and parade. Overnight Plaza Gallery Boutique Hotel. February 26: Transfer to the Tuxtla Gutierrez airport throughout the day for departing flights. The cost of this 7 night tour is $1,975 per person double occupancy. Single hotel supplement add $300. ** All other entry and guide fees for activities listed on the itinerary. Cost of this 7 night tour is $1,975 per person double occupancy. Single hotel supplement add $300. Not included are air tickets, most meals and gratuities. For this tour you need to fly into the Villahermosa airport (VSA) and out of the Tuxtla Gutierrez airport (TGZ). From most of the U.S. the best price and schedules are usually on United Airlines into Villahermosa as they have non-stop flights from Houston and Aeromexico Airlines from Tuxtla connecting through Mexico City. From the west coast of the U.S., Aeromexico Airlines may have better schedules and prices. Just let us know what airport you'll be flying from and we'll research best prices and schedules.